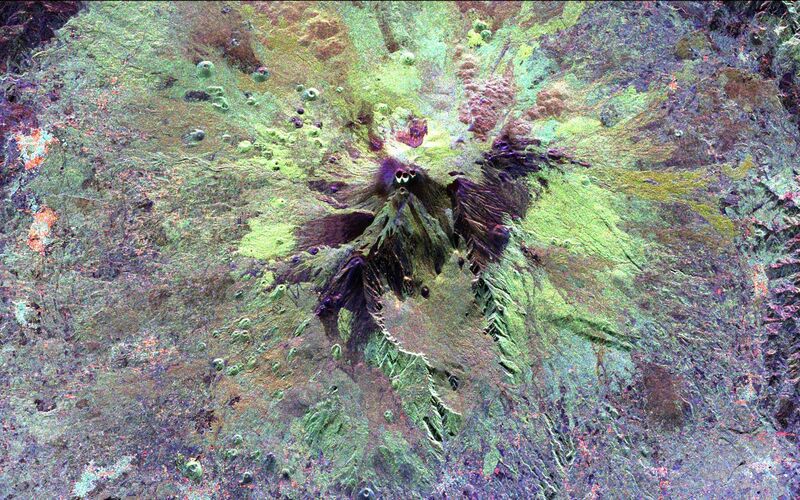 The summit of the Mount Etna volcano on the island of Sicily, Italy, one of the most active volcanoes in the world, is shown near the center of this radar image. 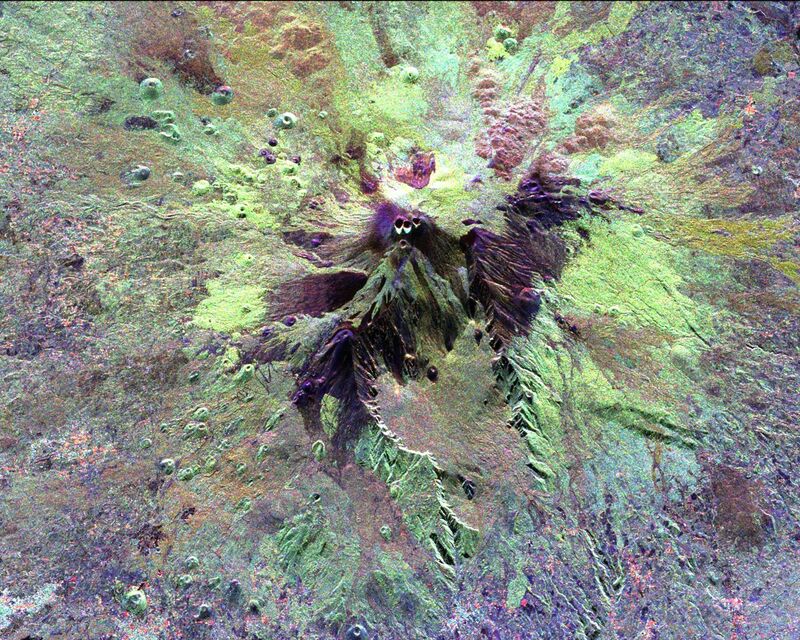 Lava flows of different ages and surface roughness appear in shades of purple, green, yellow and pink surrounding the four small craters at the summit. 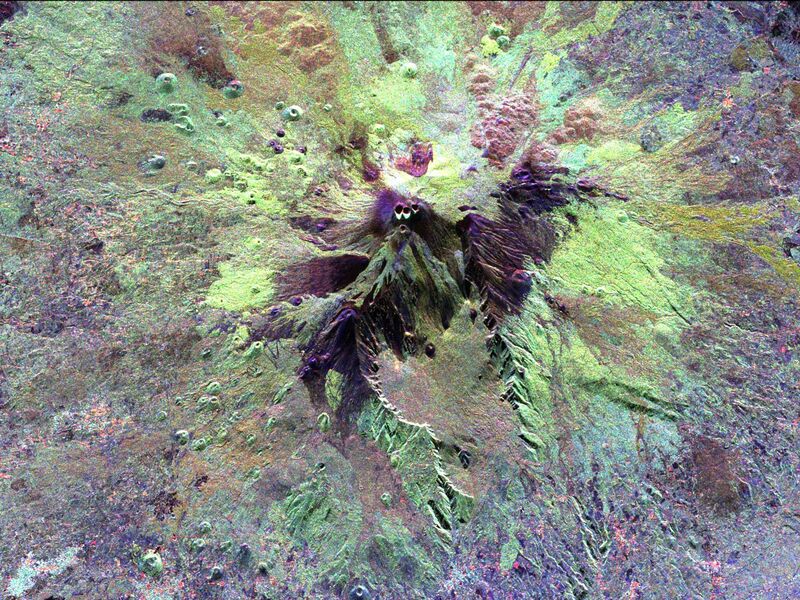 Etna is one of the best-studied volcanoes in the world and scientists are using this radar image to identify and distinguish a variety of volcanic features. Etna has erupted hundreds of times in recorded history, with the most recent significant eruption in 1991-1993. Scientists are studying Etna as part of the international "Decade Volcanoes" project, because of its high level of activity and potential threat to local populations. This image was acquired on October 11, 1994 by the Spaceborne Imaging Radar-C/X-Band Synthetic Aperture Radar (SIR-C/X-SAR) aboard the space shuttle Endeavour. SIR-C/X-SAR, a joint mission of the German, Italian and the United States space agencies, is part of NASA's Mission to Planet Earth. The image is centered at 37.8 degrees North latitude and 15.1 degrees East longitude and covers an area of 51.2 kilometers by 22.6 kilometers (31.7 miles by 14.0 miles).